In the Los Angeles Central Library, Professor Emeritus Bob Herman sees both a beautiful art deco structure and a vibrant public space. 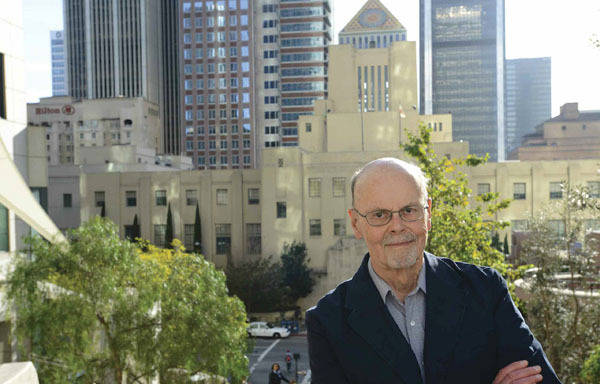 An emeritus professor of sociology at Pomona who focused on urban issues for much of his career, Herman is a long-time advocate for the renewal of L.A.’s downtown. He sees the library as a model for a successful public space, serving as both a local landmark and a vibrant hub of activity in the heart of the city. Herman’s affection for the library grew out of his long-running exploration of the central city by foot. The author of Downtown Los Angeles: A Walking Guide, Herman has given hundreds of walking tours around the city’s hills, plazas and parks. As he dug into the history of old L.A. haunts while working on his book, Herman found himself making frequent trips to the library to use its archives and records for research. His appreciation for the place stems from being both a pedestrian and an investigator. Plus, there’s the aesthetic appeal: “Architecturally, I think this is one of the best buildings in the city,” says Herman. The 1926 Art Deco structure was designed by architect Bertram Goodhue and sculptor Lee Lawrie, a renowned duo who crafted other famous sites such as the buildings in San Diego’s Balboa Park. With a blend of Egyptian and Mediterranean revival styles, the library evokes the image of a classical temple or academy, infused with an early 20th-century attitude of modern progress and purpose. As an example, Herman points to the pyramid that crowns the library’s uppermost floor. Rising from a base of columns, the pyramid is covered in tiles forming an elaborate mosaic of a sunburst and topped by a sculpted torch. Herman says the images represent the light of learning and knowledge, expressing the lofty sentiments of its designers. Inside, Herman leads the way to the central rotunda, the focal point of the historic building. Wrapping around all four walls is a richly colored mural by famed American illustrator Dean Cornwell, depicting a series of eras in the history of California and the founding of Los Angeles. On the opposite side of the building is the expansive Tom Bradley Wing, added after a fire in 1986 caused widespread damage. The wing is anchored by an immense glass atrium that extends several stories below ground. As Herman points out, the large windows and glass roofing allow natural light to filter through every level, making the space more inviting. He recalls coming downtown in 1989 for the building’s reopening after a series of arson fires and a massive renovation. Lines formed around the block as people crowded to get their new library cards. Parents brought their kids to show them where they had done their homework and checked out their first books as schoolchildren.